We’d love your help. Let us know what’s wrong with this preview of Always the Boss by Victoria Gordon. A legacy had brought Dinah to Australia, and at first she regarded the chance of a job in a television news department as a bonus - and a challenge. Conan was wrong in every opinion he held of her. She despaired of ever making him see the truth about her as a worker - and as a woman! To ask other readers questions about Always the Boss, please sign up. I absolutely hated it. The most cliche story I've ever read. Perfect guys like that don't exist! Gordon Aalborg was born on February 5, 1942 in Alberta, Canada. He began his writing career as a reporter, columnist and bureau chief at The Edmonton Journal in his native Alberta. He wandered off to Australia in the '70s as a freelance journalist and radio/tv broadcaster. 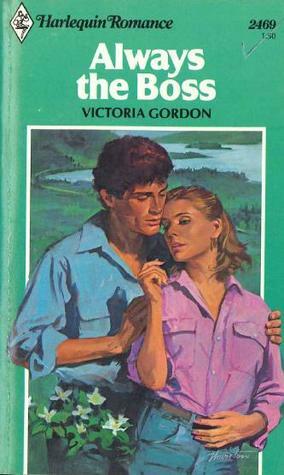 The best-selling romance author, Victoria Gordon born in response to the publisher's claim that "no man" could write Harlequin Gordon Aalborg was born on February 5, 1942 in Alberta, Canada. He began his writing career as a reporter, columnist and bureau chief at The Edmonton Journal in his native Alberta. He wandered off to Australia in the '70s as a freelance journalist and radio/tv broadcaster. The best-selling romance author, Victoria Gordon born in response to the publisher's claim that "no man" could write Harlequin category romance (Gordon is widely believed to be the first man to seriously meet the challenge) , and she survives after more than twenty novels published throughout the world. Gordon Aalborg is married with to mystery writer Denise Dietz, who helped him in his book Finding Bess.